This trio perfoms seldomly, but always it happens it is a moment of real joy and dive into the deeps of klezmer. 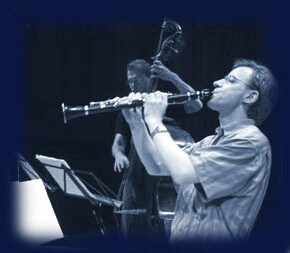 Kari Kriikku is one of the most interesting clarinetplyers in the world of our time. Mostly performing in the field of classical, contemporary and chamber music in this trio he really lets go in klezmer style. Markku Lepistö is well known accordeonist in the etnomusic field, perfoming with Wärttinä, Doina Klezmer, Markku Lepistö Band and several other groups. Sampo Lassila is one of the top bass players in Finland. His regular work includes performing as a musician and composer in a large variety of groups and styles from etno to chamber music. His own group Sampo Lassila Narinkka, Sound & Fury, Doina Klezmer, Nada , Free Okapi, Zagros Ensemble and Sinfonia Lahti are among the recently most active groups and orchestras.